Search.hofficeworksuite.com is a suspicious search engine that mainly targets Google Chrome and Mozilla Firefox browsers. Internet users can set this as the default homepage unknowingly by just clicking on misleading pop-up messages that triggers the modification of browser settings. 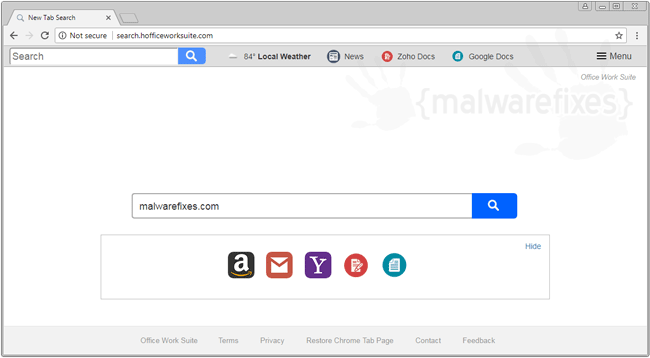 On some instances, Search.hofficeworksuite.com is enabled on the browser through the installation of doubtful extension called Office Work Suite. It is risky for the browser to keep this unwanted program active, because it can perform various alterations and manipulate browsing activities. Earlier case revealed that Search.hofficeworksuite.com could dominate homepage and new tab pages on its first emergence. After that, this browser hijacker will set itself as the default search provider. In that case, all online searches are channeled through unwanted servers that can provide unsafe search results and malicious paid links. As you can notice, Search.hofficeworksuite.com brings nothing but nuisance. Although it may appear as valid and attractive search engine due to presentable background, search results and links it display are questionable. In addition, Search.hofficeworksuite.com and relevant adware are able to gather various browsing data. It can record visited websites, search keyword, and personal information. Collected data can be misuse to intensify the display of striking advertisements that are delightful to users. In the end, this adware can persuade users to buy a product or acquire online services. As of now, we can offer no other option but to remove Search.hofficeworksuite.com as soon as possible. It may not be as hazardous as computer viruses, but it can still cause some troubles to ones security and online privacy. Proceed with the removal of Search.hofficeworksuite.com by executing the procedures below. As suggested, extensively scan the computer with effective anti-virus and anti-malware tools. This scanning method is vital in locating and deleting deeply hidden malicious codes and files. 3. Look for and remove Search.hofficeworksuite.com or Office Work Suite entry. If not present, look for any suspicious labels that was installed recently. 4. It searches for presence of harmful programs, plug-ins, add-ons, or any data that were found malicious and linked to Search.hofficeworksuite.com. You need to Clean all items detected by this tool. After the previous scans, you may have deleted Search.hofficeworksuite.com from the affected browser. This next step will ensure that no more module of adware will be left on the browser. This free tool scans and checks the browser for unwanted add-on and extension, and if found, Avast Browser Cleanup will give you a report and suggestion. 4. Avast Browser Cleanup will confirm before it permanently deletes the add-on. Please click Yes to proceed with the removal of Search.hofficeworksuite.com on the affected browser. Cleaning your internet browser from clutter and unwanted add-on/extension is a must when dealing with Search.hofficeworksuite.com. The procedure below discuss on resetting various browsers to its default state. 3. 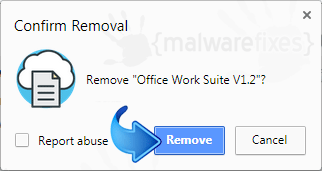 On Extensions window, please delete Search.hofficeworksuite.com or Office Work Suite by clicking on Remove or Trash icon. 4. Google Chrome will prompt for the confirmation of Search.hofficeworksuite.com removal. Please click on Remove button to proceed. Resetting Google Chrome to default settings is helpful in deleting hard-to-remove extension such as from Search.hofficeworksuite.com. This method is highly advisable to perform if you have difficulty in removing unwanted extension. This function will reset your home page, new tab page, search engine, and other areas affected by Search.hofficeworksuite.com. Unwanted extensions will also be removed from the browser. This will not affect your bookmarks, history, and other saved data. You may also run Chrome Cleanup function from this page. An integrated tool from Google Chrome but with more advanced Adware scanner feature. 3. Under Add-ons Manager, look for Search.hofficeworksuite.com or Office and click associated Remove button. See image below for reference. This section describes how to remove unwanted extension from Firefox that may be related to Search.hofficeworksuite.com. This process can fix many browser issues by restoring Firefox to factory settings without affecting your essential information (bookmarks, browsing history, passwords, and Internet cookies) on the browser. If you desire to remove only specific extension, please see manual removal of add-on from Firefox. 4. Firefox browser will close and start the resetting process. When done, it will display a list of restored data. Search.hofficeworksuite.com should be gone by now. Click Finish to open a fresh version of Firefox.